To care for your oil painting all you really need to do is keep the art work dusted! 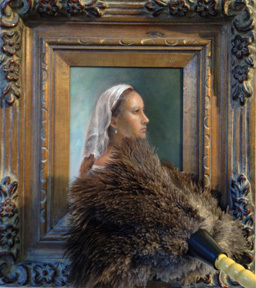 The preferred method for dusting oil paintings is to use Ostrich Feather Dusters, which attract dust like a magnet and are very gentle on the artist's brush strokes in the painting. 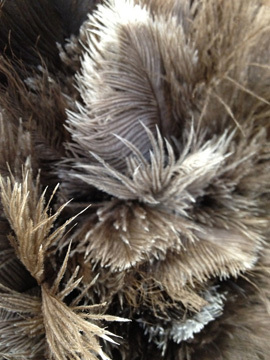 Dusters made from ostrich feathers are effective because the feathers contain natural oils that attract dust and gather it in fine feather barbs. The trapped dust is then removed by a vigorous shaking outside. Please note, problems with paintings such as cracking, pealing or yellowing should be referred to a professional conservator. Never use water or cleaning fluids on your oil paintings. 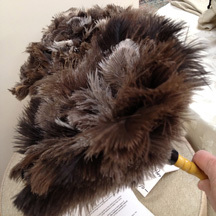 Ostrich feather dusters are best used by lightly waving the duster back and forth against a surface. No pressing or rubbing is necessary, nor is it desired, as this could bend the feathers. When you are finished dusting, clean the duster by taking it outside and shaking it. For occasional deeper cleaning, fill a sink with warm water and a couple of drops of shampoo. Gently immerse the feathers, stir them in the water and then rinse them off. Pat them dry with a towel and then fluff them up with a warm (not hot) hairdryer. Creative Brush has Ostrich Feather Dusters for sale for $10.00. They are high quality ostrich feathers dusters which are hand made from fine, washed and treated ostrich feathers from South Africa.